A driver who crashed into a police dog van leaving an officer with glass shards in his eye and two police dogs injured has been jailed. John McCabe also dragged a police officer along the road and almost hit her colleague as he attempted to evade capture in Sunderland on 30 December. He was jailed for four years and 10 months after admitting eight charges at Newcastle Crown Court. McCabe, 31, of The Grove, Sunderland, was banned from driving for 12 years. Sgt Alan Keenleyside of Northumbria Police said it was lucky no-one was killed. Police were alerted to McCabe crashing a silver Vauxhall Corsa into a car on Hylton Road at about 11:00 GMT. 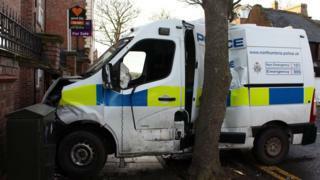 McCabe then crashed into a garage in Gorse Road where two police officers attempted to arrest him. But McCabe reversed dragging the female officer and almost hitting the other PC. Shortly after, he smashed into the police dog van causing the officer to crash through a window - breaking three ribs and getting glass shards in his eye. Two of the three dogs in the van, - an eleven-month-old German Shepherd called Rossi and a seven-month-old Cocker Spaniel named Kassie - have both been retired from service due to the injuries they sustained. McCabe and a female passenger were both taken to hospital with serious but non-life threatening injuries after officers managed to free the pair from the wreckage. McCabe pleaded guilty to causing serious injury by dangerous driving, driving while disqualified, driving without insurance, failing to provide a specimen, two counts of failing to stop after an accident and two counts of failing to report an accident. He was jailed for 58 months during a hearing at Newcastle Crown Court.